SIGNIFYING THE START of a NZ$40m (£21m, AUD$36m) deal inked late last year with UK bus manufacturer Optare, Tranzit NZ will accept the first of a proposed 114 Metrocity Euro 6 buses this week at an official British High Commission lunch ceremony with Acting Commissioner Mrs Helen Smith in Wellington on Thursday. 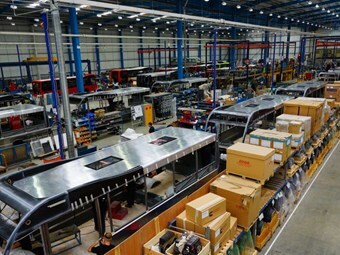 Optare Metrocity buses being built in the UK. Wellington, New Zealand, will receive the first of 114 them soon (Photo: Optare UK). Touted as Optare's biggest ever Australasian export order, the agreement will see Optare – a subsidiary of India-based Ashok Leyland – begin providing, "114 innovative and environmentally efficient Metrocity buses to the New Zealand capital, Wellington" with the, "entire order set to be fulfilled by July 2018," the bus body manufacturer states. Tranzit Group, one of New Zealand’s largest public transport operators, has more than 90 years’ experience in the transport industry and operates in excess of 1000 vehicles from Cape Reinga to Bluff. The buses manufactured in the UK by Optare will be operated by Tranzit on behalf of Greater Wellington Regional Council. The bus features the latest Euro 6 diesel engine, has a passenger capacity of up to 55 and will be the lightest with this capacity to operate in the area, organisers state. The buses will deliver, "significant annual savings in fuel consumption and operating costs". At the time of the deal announcement last September, Graham Belgum, president of Optare, said: "This is a significant step for Optare as part of our international export strategy and signals the exciting growth opportunities available to us in Australasia. Further it recognises our continued innovation in lightweight products that use fuel efficient and environmentally friendly technologies." Managing director of Tranzit Group Paul Snelgrove said: "A team of us travelled the world to find the ideal lightweight solution (12-tonne GVM) for New Zealand roads. We were impressed with the lightweight design of the Metrocity combined with the excellent passenger capacities it offers. The design’s reputation for excellent performance with regards to fuel efficiency particularly appealed to us." "In addition, the Metrocity provided us both a small and medium-sized vehicle option [of] 10.1m and 10.8m respectively, with identical body and running gear. The 10.1m Metrocity, with a shorter wheelbase, is ideal for travelling through some of Wellington's narrow streets and hilly terrain," he explained. The buses will be deployed throughout the Greater Wellington region from the CBD all the way up to Palmerston North. The order will see a mix of 10.1 and 10.8-metre Metrocity buses deployed on a range of routes including city, suburban and semi-rural operations. The buses will use the latest-technology Mercedes-Benz drivelines, ensuring low emissions and the highest levels of efficiency and are eco-friendly. Optare distributor Bus Corp Oceania (BCO) general manager Jason Pecotic says the low weight from the monocoque construction means the Metrocity offers 30 per cent more seating capacity, while still fitting within New Zealand's 12-tonne GVM tax bracket. "Optare's monocoque design saves around 900kg in weight, meaning it generates more pay-load while saving the operator money," he said. "In this case we estimate that the Metrocity will deliver savings of around $4000 per bus per year for Tranzit before taking into account double-digit savings in fuel consumption and operating costs." BCO appointed Trucks & Trailers NZ (www.trucksandtrailers.co.nz) as the service dealer and parts distributor for Optare buses in New Zealand. NB: Further information and pics to come in ABC magazine.